Founded by Amy Bagwell, Graham Carew, and Amy Herman, Goodyear Arts evolved from the artist-led pilot program Skyline Artists in Residence (July 2015 - January 2016) in an defunct Goodyear Tire Center in Uptown Charlotte donated by Crescent Communities. Its second building, a former Sears & later nightclub across Uptown on College Street, was donated by Levine Properties & Lennar LMC (January 2016 - June 2017). 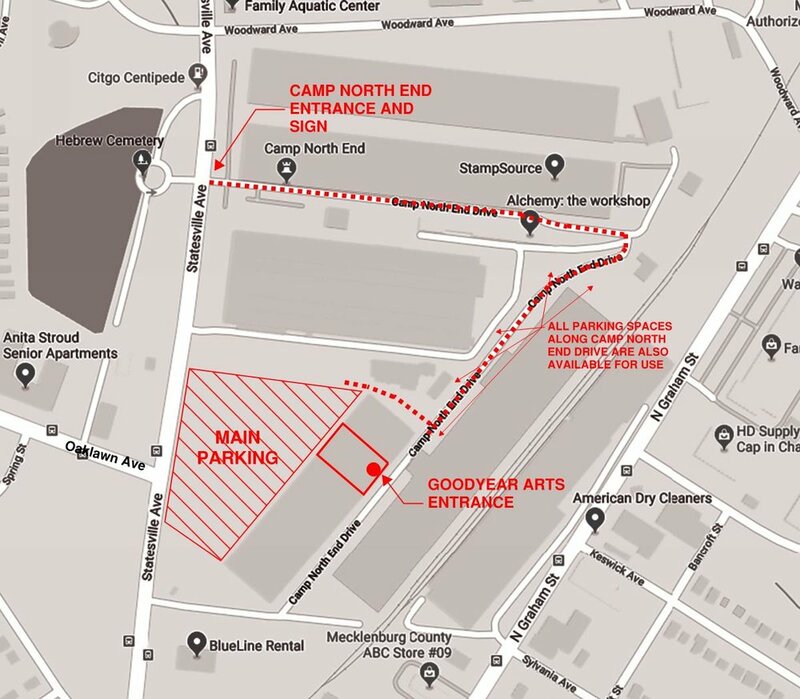 Goodyear Arts moved to Camp North End in June 2017 and will remain there through the first half of 2020 in space donated by ATCO Properties and Camp North End. Goodyear Arts residencies and programming are supported by Knight Foundation, Women's Impact Fund, and Arts & Science Council. Goodyear Arts is open during all events and most Fridays from 6-9pm. Follow us on social media and visit here for updates! Please email goodyearartsclt@gmail.com if you have any questions or comments, or if you'd like to make a tax-deductible donation. Thank you!